Well, at least they are partnering with a proven jewelry company and some generous folks who want to do some fundraising for them this Christmas season. 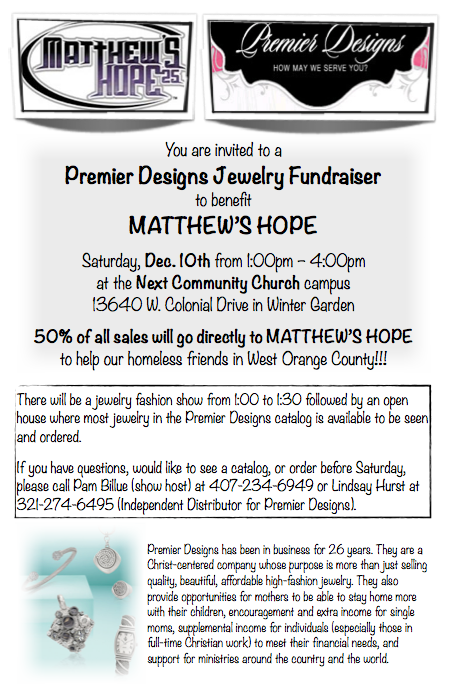 Buy some awesome jewelry for Christmas gifts, and 50% of the sales go to benefit Matthew’s Hope. i am a doubter and a believer, a follower and a leader, a bride and a husband, a son and a father, a brother and a friend, a learner and a teacher, a writer and a reader, an art-lover and a sports-fan. _the church of west orange meets every 2nd Wednesday of the month from 9:30am to 11am at www.HouseBlendCafe.com in Ocoee. _the West Orange Ministerial Alliance meets every 1st Thursday of the month for lunch at 11:45 at www.GoldenPondCommunities.com in Winter Garden. _Matthew's Hope (ministry to the homeless) every Tuesday. Come any time from 9am to 5pm. Lots of help needed. Lots of help being given!!! _Sponsor a child in Chapa, Ethiopia (the village that will be by summer 2011 drinking clean water from a well that the Church of West Orange together provided). Go to www.GoandDotheSame.org for details. _Details coming soon about going on international missions to serve together in both the Dominican Republic and Ethiopia in 2012!!! Click here‎ to "LIKE" us on Facebook.